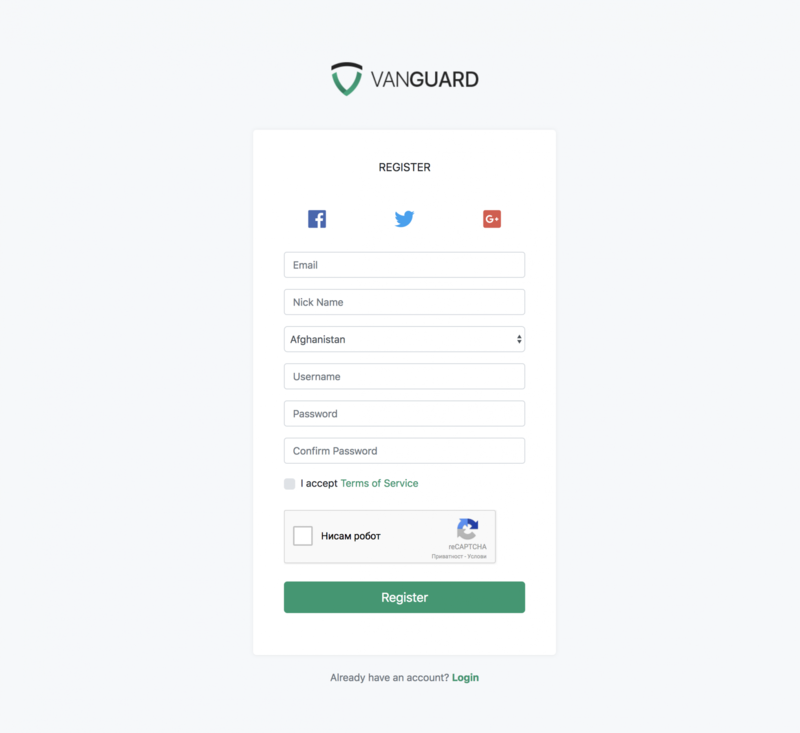 Registration form customization is something that probably no one can avoid if it comes to Vanguard customization. If you are familiar with Laravel then adding another field into registration form will be an easy task for you. However, for those who don't have a clue how Laravel is working, this will be a challenging tutorial. Let us say that we want to add two new fields to the registration form: Nick Name and Country. Also, we will make Nick Name to be required and minimum 3 characters long. This is probably the most difficult scenario, so if you understand how this one is working, then you can add any other field into that form. Since Nick Name does not exist into our database schema, we will have to add it. There are many ways to add this field into users table, and we will cover two of them. Creating migrations for your database schema is the best way to create and modify your database schema. Also, since migrations are basically PHP files, those files will be stored on your Version Control System (Git, Mercurial, etc.) so any of your coworkers will have access to database schema that is being used for your project, and, the best thing about it, is that you will be able to see full history of changes for any of your database tables. When it is executed, this migration will add new column into users database table called nick, and it will be type of VARCHAR(20). If you want to learn more about Laravel Migrations, check the documentation. If you check the database using PHPMyAdmin (or some other similar app) you will see that our nick field is added to users database table. If for some reason you decide not to use the migrations for altering the database, you can manually add missing nick field using PHPMyAdmin or similar application. Just make it varchar(20) and we are good to go. Note! This maybe looks easier for now, but what if you forgot to tell to your co-workers that you have added that new field? Or even if you tell them, each one of them will have to create it manually. Since we are going to allow users to select their country on registration form, we have to fetch all available countries from the database, and to pass those countries to our registration view. * Show the application registration form. We are now ready to update the form HTML. As you can see from previous code snippet, where we have updated getRegister method for our AuthController, there is some view function call that says view('auth.register', .... This actually means that it Laravel will look for our view into resources/views/auth/ directory, it will look for file called register.blade.php. That's the file we need to update. <input type="text" name="nick" id="nick" class="form-control"
Note! If you curious how Form::select works, check Laravel Collective documentation. Since we have defined that Nick Name will be an required field with minimum length of 3 characters, we have to add one more validation rule inside $rules array available in RegisterRequest::rules method in app/Http/Requests/Auth/RegisterRequest.php file. This validation rule will make our Nick Name field required his minimum length must be 3 characters. Note! If you want to know more about Laravel validation and available validation rules, check the validation documentation. Since we have added new database field inside our users table, we have to update our users model and add that field to your fillable attributes array. So, just edit app/User.php and add field nick into $fillable array, right after remember_token field. And the last step is to actually tell to our AuthController that we want him to use two more fields which we have added to our registration form.